Greetings, Stampers! It's Sunday and time for another Paper Players Challenge! 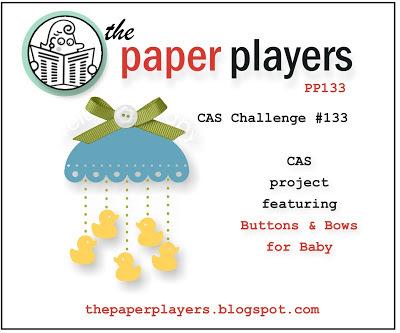 This week Anne Marie has a fun clean and simple challenge for us: Buttons and Bows for Baby! I must admit, initially I was a little daunted by this challenge. How do you make a clean and simple card with buttons and bows? However, after a little thought, I came up with a layout that I think worked perfectly. I've been wanting the Baby Tees Wheel Stamp forever, but just never got around to ordering it. I finally did, and this is the first time I'm inking it up. I used Black Stazon Ink to stamp the images, and then cut out one baby tee by hand. I adhered it to an oval cut with an Ovals Framelit. I colored the tee and the hanger with ink pads and an Aqua Painter. 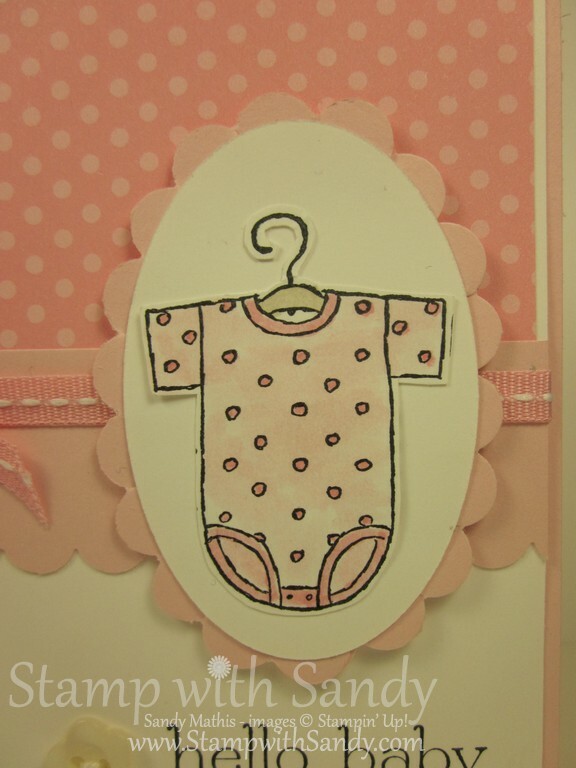 I used the small point of a Pretty in Pink Marker to color the dots and trim. Are you wondering where I got that fabulous scalloped oval border? I made it! I punched a thin strip of Scallop Trim Border and cut slits between each scallop to be able to shape it behind the oval. To learn more about this technique you see a tutorial on one of my previous posts, here. This is perfectly adorable...and I can't believe you made the scallop behind the oval!! That is incredible. You have infinite patience, my friend! Your coloring is wonderful...what a sweet image! What a sweet baby card! You did a great job coloring that cute onesie, and I love all the polka dots. Adorable, Sandy! The scalloped oval is the perfect touch!